This man is reputed to have a price on his head in Ciudad Juárez. He is not one of the responsible parties for the repeated murders of young women in that border city. Instead, he had the temerity to write a book about them, in which he presents reasonably credible evidence that very important people in Mexican government and law enforcement are at least implicated in those crimes. The book is called Huesos en el desierto (Bones in the Desert) and was released a few years ago by Anagrama, the prestigious Barcelona publisher. It has been translated into Italian and French, but unfortunately not into English. 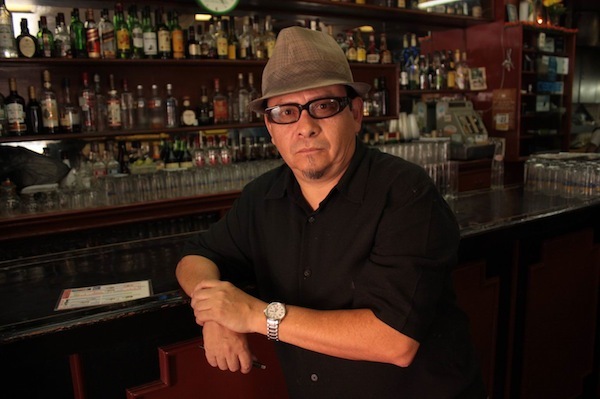 The author, Sergio González Rodríguez, has also published novels, books of essays and writes a weekly column for the newspaper Reforma about restaurants and bars. 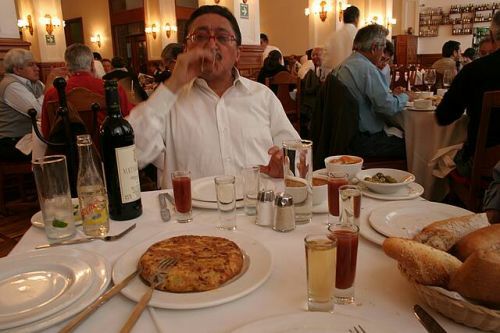 Pictured here in a traditional Iberian eatery called the Casino Español, located in the centro histórico of Mexico City, it is perhaps churlish for me to point out that he is drinking a shot of tequila, which serves as the chaser for the nearly empty vodka-and-tonic at his side. Both libations are warm-ups for the bottle of red wine burning a hole in the tablecloth. Note that González Rodríguez staunchly ignores the tortilla española and the bread on the table. This is his idiosyncratic version of a hunger strike, which he threatens to continue until the Juárez murders are solved.